Excerpt/Capsule: Learn how to delete shapes from an existing SmartArt graphic in PowerPoint 2011 for Mac. Select your existing SmartArt graphic, as shown in Figure 1. 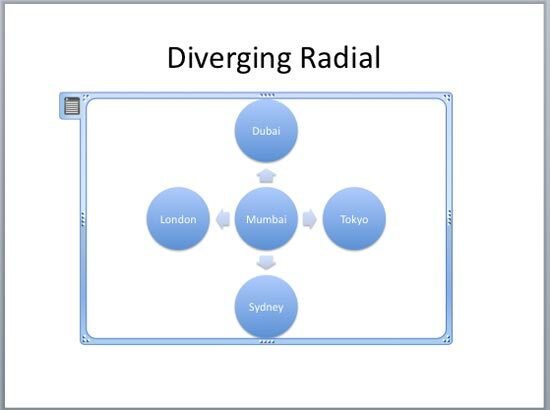 The SmartArt graphic variant that we are using (and have selected) is the Diverging Radial. Select the shape within your SmartArt graphic which you want to delete (see Figure 2). 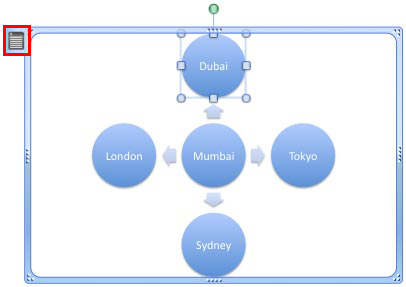 We have selected the top most circle with Dubai written inside it (refer to Figure 2 again). Note: To delete a shape with text written within it, carefully click the border of the shape to select it. Clicking within the shape will select the text rather than the shape. Now, just press the Delete key on the keyboard. Alternatively, you can delete the selected shape through the Text Pane. To access the Text Pane, click the Text Pane icon that you can see highlighted in red in Figure 2, above. In the resulting Text Pane, make sure that the text representing the shape to be deleted is selected, and click the Delete icon (the icon with a red minus sign) that you can see highlighted in red in Figure 3. Either way, you will delete the selected shape from the selected SmartArt graphic. 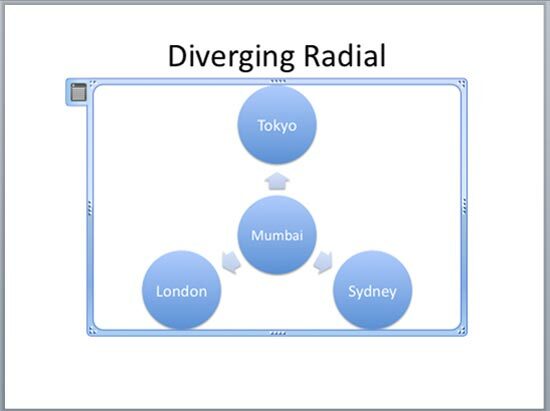 Figure 4 shows the Diverging Radial SmartArt graphic that auto-adjusted itself after the selected shape was deleted. Compare Figures 1 and 4 to see the difference.